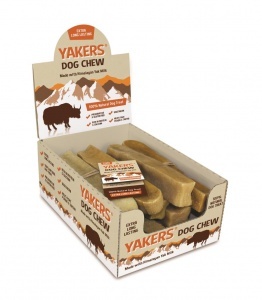 YAKERS Himalayan Dog Chews are 100% natural dog chews made with Himalayan Yak Milk. Sold individually - approx 15cm length. For dogs over 4 months old, YAKERS dog chews are great for serious power chewers. They are softer in comparison to extra tough dog chews like Antlers & Buffalo Horns, but can take much more chewing that a standard dog chew. The hard texture means dogs need to soften and work at the treat before they’re rewarded with small pieces to chew off. YAKERS dog chews are a healthy and tasty treat for your dog as they are in low in fat (only 5.2%). Best of all they are also gluten-free, preservative free, vegetarian, rich in calcium and protein with no nastys added, to ensure they are naturally good for your dog. YAKERS are also great for removing plaque and promoting oral health. Made in the hills of the Himalayas using a mix of skimmed Yak and Cow milk. A very small amount of lime juice and salt is added to harden the milk, which is then compressed into blocks and traditionally smoke dried for 28 days to give the cheese chews their unique flavour. Once your dog has enjoyed their YAKERS chew, simply take the small end piece that is left (usually around 3-4cm) and place it in the Microwave for 30 to 60 seconds. The end piece will hiss, and begin to puff up, much in the same way that Popcorn does, just without the Popping noise! When the Piece has stopped puffing up, it will be hot so you need to let it cool first before giving back to your dog. The texture of the YAKERS dog chew totally changes to now be a soft, honeycomb crumbly treat – delicious! Isn’t salt bad for dogs? Salt in large amounts is harmful for dogs as it is for humans. However YAKERS only use a tiny amount of salt along with lime juice to get the cheese to harden at the very start of the manufacturing process. The salt content in YAKERS is less than 0.1%. Not all dogs are lactose intolerant, but if they are there is less than 1% Lactose in YAKERS. Both the cream and the whey are removed from the milk as part of the manufacturing process, meaning the levels of lactose are very, very low. How large are the chews? 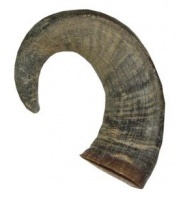 This Extra Large size chew is around 15cm long and weighs around 140g on average. How do I store my YAKERS? If your dog can resist them for long enough, simply keep your YAKERS dog chew in a cool and dry place until you want to treat your dog.